State Representative Joe Straus (R-Bexar County), the Speaker of the Texas House of Representatives, is a dying breed. A comparably moderate Republican, he runs the chamber based on the consent of its members (a novel concept). Instead of groveling to the whims and caprices of the majority of the majority, like Speaker John Boehner (R-OH) or soon-to-be-former Majority Leader Harry Reid (D-NV) in Congress, Straus actually gives a voice to all proposals with majority backing. Often times, these are red-meat conservative proposals, like solving the non-existent problems of voter fraud and unsafe abortion clinics, but they have sometimes been realistic and sensible ideas to solve the state’s problem. Straus, of course, came to power by aligning himself with the Democratic caucus, and has remained in office largely through their toleration. In 2009, after three disastrously controversial sessions under the stewardship of Speaker Tom Craddick (R-Midland County), Straus overthrew the incumbent and has been distrusted by the most extreme factions of his party ever since. Some have a pathological hatred of anyone who work with Democrats and some are just anti-Semites (Straus is Jewish), but the main point is that the Tea Party and Straus go like water and oil. A few names have popped up over the succeeding sessions to challenge Straus, but they have — without exception — dropped out before the actual vote came up. State Representative Scott Turner (R-Rockwall County), who is challenging Straus ahead of the 2015 session, says he will stay in until the bitter end to demand a vote. However, the evidence is just not there that Turner can mount anything close to a credible campaign. If he gets more than 25 votes, I will legitimately be shocked. First, let’s do some simple math. There are 150 members, meaning roughly 76 are needed to secure the gavel. We can put the 52 Democrats in as a given for Straus; they’ve supported him before and will be sure to do so again when the only other option is Turner, arguably too cozy with moneyed right-wing interests. Granted, one Democrat, State Representative Mike Villarreal (D-Bexar County), has resigned and his seat will not likely be filled by early January. Thus, for the sake of argument, there are 51 Democrats. Then we can toss in 7 Tea Party-affiliated Representatives from the DFW portion of the state, who recently signed an open letter (Letter 1) stating their support for Straus. They are State Representatives Myra Crownover (R-Denton County), Giovanni Capriglione (R-Tarrant County), James Frank (R-Wichita County), Phil King (R-Parker County), Tan Parker (R-Denton County), Ron Simmons (R-Denton County) and Drew Springer (R-Cooke County). Capriglione, a true Tea Party darling, publicly announced and defended his support for Straus at the Northeast Tarrant Tea Party, one of the most infamously anti-Straus organization. It was quite the spectacle. Anyways, that brings the total up to 58. Today, a further 7 State Representatives and State Representatives-elect publicly backed Straus, in yet another open letter (Letter 2). They are Trent Ashby (R-Angelina County), Cecil Bell (R-Montgomery County), Travis Clardy (R-Nacogdoches County), John Otto (R-Liberty County), Chris Paddie (R-Harrison County), Dade Phelan (R-Jefferson County) and Gary VanDeaver (R-Bowie County). The two open letters, respectively, touted Straus’ conservative credentials (first accessed via Quorum Report, though the letters themselves are open). This now brings the total up to 65. Straus can be counted upon to vote for himself, as can be some of his closest lieutenants: State Representatives Byron Cook (R-Navarro County), Charlie Geren (R-Tarrant County), Jim Keffer (R-Eastland County) and Jason Villalba (R-Dallas County). That brings us to 70. Now, I’m just spit-balling here, but if I had to name six more supporters, they would be State Representatives Drew Darby (R-Tom Green), Sarah Davis (R-Harris County), Kyle Kacal (R-Brazos County), J.M. Lozano (R-Kleberg County), J.D. Sheffield (R-Coryell County) and John Zerwas (R-Fort Bent County). They have not made official statements, but I would be very surprised if they voted the other way. Your mileage may vary. That’s just math, folks. 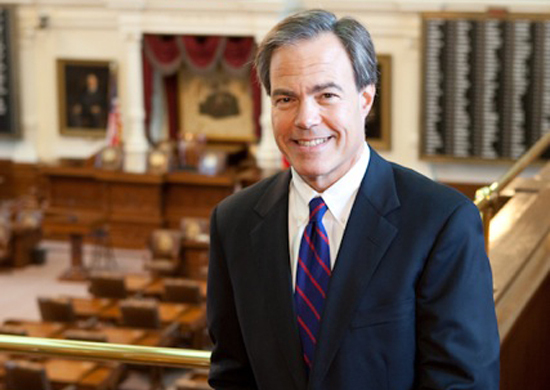 But the good news is that, at the end of the day, Straus will still be in charge for the 84th Legislature. In all likelihood, another faction of six or seven conservative Republicans will rally to Straus’ side tomorrow or the next day, and make my guesses moot. Scott Turner just will not win. Full stop. I obviously think Straus is more moderate and pragmatic his opponent, but that is not really the reason I am supportive of him. Lest the liberals think he will secretly go along with their agenda, like many on the far-right believe, Straus will put up disastrously extreme pieces of legislation this next session, for the simple reason that they will pass easily in the heavily Republican chamber. But he will do so as a result of the consent of the members, not because of any despotic proclivities or loyalties to outside parties. By that standard alone, he is better than Craddick, Turner or anyone else Michael Quinn Sullivan might prop up next. The Trib has a pretty good article about the recent “Texas Solution” to Medicaid expansion. Essentially, the House Appropriations Committee recently voted 15-9 to expand Medicaid, specifically requesting a block grant to so . I have no idea what the exact roll call was on the vote. There are 27 members of the Appropriations Committee, of which 18 are Republicans and 9 are Democrats (if I counted right). The Tribune article insinuated that it was just the Tea Party Republicans who opposed the measure. John Zerwas (R-Fort Bend County) authored the bill to expand Medicaid in clear opposition to both Speaker Straus and Governor Perry. The Tribune article explains what the program would do pretty well. Simply put, it’s would be boon to some private sector parts, and may include a completely separate program. At the end of the day, however, it is going to have a pretty similar effect: reduced healthcare costs up to 133% of the poverty line. As much as this may not have been my top choice on Medicaid Expansion, I think it will be the best liberals can get.